The Orchard Lake Schools will host America’s most anticipated canonization celebration, in honor of Saint John Paul II and Saint John XXIII. 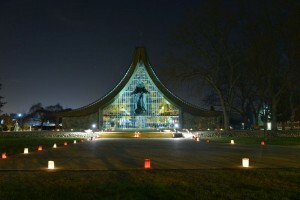 An open all-night vigil will be held at the full-size replica of the Grotto of our Lady of Lourdes, followed by a real-time transmission of the canonization ceremony from the Vatican on a 14-foot screen in the Shrine Chapel of Our Lady of Orchard Lake. 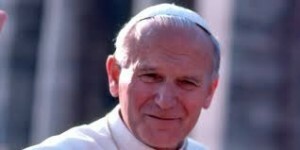 John Paul II visited the Orchard Lake Schools twice in his life. Detailed information and the event schedule can be found at www.polishmission.com. chefs will prepare a signature recipe. LIVE CONNECTION — Orchard Lake Schools Chancellor-Rector Msgr. Thomas C. Machalski, Jr. and Vice Chancellor Anthony Koterba will address event guests via Skype on the big screen, live from the Vatican. Immediately following, Divine Mercy Mass will be celebrated by His Excellency Bishop Francis Reiss at 2:00 pm. This mass will be the first held in the presence of a newly-acquired relic of St. John Paul II, featuring four singers from the Michigan Opera performing a new arrangement of the hymn “Zdrowaś Maryja”. All are invited to an authentic Polish dinner afterward: tickets for the dinner may be purchased in advance or bought at the door. THE HISTORY — The Orchard Lake Schools is America’s oldest Polish educational institution, and was founded by Fr. Jozef Dabrowski in Detroit in 1885. It encompasses SS. Cyril and Methodius Seminary, St.Mary’s Preparatory, and The Polish Mission. Today, the combined student body is over 600 students, and the Orchard Lake Schools is located at the former Michigan Military Academy.